Its now 3 weeks into the British Summer Heatwave, the warmest its been for 7 years according to the news, only 4 months ago it was below zero with snow on the ground, then it was too cold to work on the car, and now its too hot ! ?. 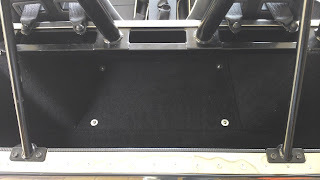 Since starting the car last week I have had a big smile on my face, such a good feeling that box's of bits have all come together to make a beautiful sound, I even came down in the middle of the night just to make sure I was not dreaming ? The weekend came and Spent the time with the family so didn't touch the Zero until Tuesday.... then nothing seemed to go right. Time for them to go on, once again bit of head scratching, measuring, marking, standing back and looking. Drilled a couple of holes through the arch at the front and rear, marked the bodywork, drilled and popped a couple of rivnuts in. Problem 1 of the day... broke the rivnut setting tool ! this is the second time I've done this, the tool only lasted 6 rivnuts ! (you get what you pay for). So Left my mate Simon to it, while I went out to find a new setting tool. Halfords... didn't have a clue what the tool was or what rivnuts are ? Useless. Machine mart... the same as Halfords... Useless ! Then 4 different motor factors, NEVER SEEN THESE TOOLS BEFORE ! !, 2 hours later... Cromwell Tools, a nationwide tool distributor, got 5 blokes looking at my broken tool, and not one knew what it was or did, however they did find one in their catalogue... £349 ! Finally found a little tool store that had one in ! it was one that fitted onto a cordless drill, but they had one in stock ! and the very nice lady behind the counter knew more about them than all the other men put together. The name of the company is "The tool academy", Sutton In Ashfield. So arrived back home and Simon had trimmed the carpet ready for fitting in the boot. Back to the rear aches, more drilling, marking, and rivnutting, and the drivers side is on. Now onto the passenger side, and a copy of the other arch, then problem 2... Broke the new rivnut setting tool !!! AAAARRRR!!! Will have to return that in the morning. Next job... Load up the ECU with a map ready for the emissions test on the IVA, while Simon was doing that, I was getting the rear indicator/brake light clusters ready for the arches, these needed to had a 4 way connector block fitting with spades crimped instead of the bullet type which came with the units, and then mark out the arches for drilling. ANOTHER PROBLEM !!... Number 3... The Com's lead supplied with the ECU is the old serial type and my laptop is USB only ... AAARRRRGGGG!!! Now I need a conversion lead. PC world, don't do serial connections anymore, useless. Maplin's do a lead but its £29.99... way too expensive ! So back onto EBay, next day delivery £1.79... that's better ! 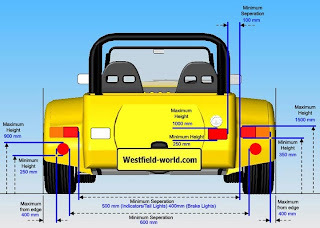 Looked up the spec on the positioning of the rear lights, and basically the min height for the lights is 350mm from the floor, there are some other measurements in relation to positioning to other lights but a photo will be more useful. So I set the lights at 400mm so that's plenty of room for adjustment of the ride height. 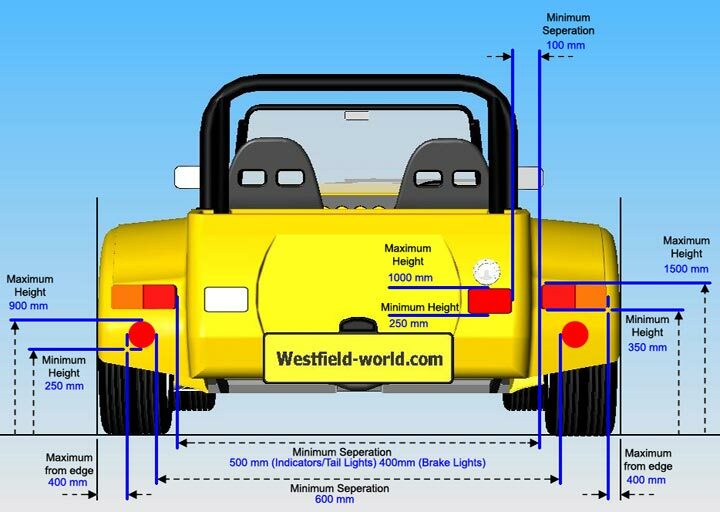 Sorry for it saying "Westfield" on the back, but its one of the better photo's I could find on the Internet for British IVA. Left hand indicators working, right hand NOT ? Today is a real test ! big scream, sweating with the heat, and now a proper headache coming on ! Too cut a long story short spent the next 90 minutes testing and following the wiring back to find the fault, and ended up at the indicator storks on the steering column. Looks like the switch is not working very well. Taken off and these will be returned to GBS tomorrow. Alex arrived back from school, and gave his time to help, mainly bending down to pick up things because both Simon's and my back was starting to hurt, been up and down on my knee's all day so they where shot, time to call it a day I think ? The build will continue later this week, I need a day off to get issue's sorted ! Spent the day sorting out the previous day's issues, then having a lazy afternoon in the sun, unfortunately the afternoon planning went pear-shaped when my boys returned home from sports day with a pile of washing to be done ! 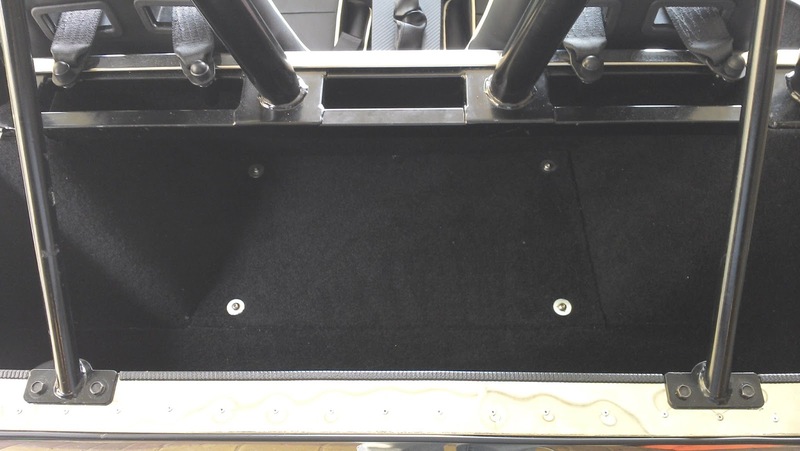 Started on a positive note, Simon got "stuck in" to the boot carpet... seriously sticky stuff, same glue as the cockpit carpet but at least the car is outside so won't get that "high" ? I started on the nose cone, chrome surround with a black honeycomb mesh as the grill. Measured out the cycle wings for the repeater indicators and drilled. Reverse light ! When we did a brief test on the gearbox last week when we started her up for the first time the reverse light failed to come on. Tracing the fault back from the light it looked like the switch on the gearbox was at fault. Sorry for the language bit this was a bast**d to get too ! Simon spend a good 40 minutes getting the 2 bolts out. Once out we tested it with the multimeter, yep - not working. Internet search, and the first company we call has one in stock ! Other side of town we quickly sped, only to find its the wrong kind of switch. (unhappy face). Off to another parts emporium... puzzled faces of bewilderment greeted us from the other side of the counter ? Lastly the "Ford" dealership in town, this was not looking good, none on the "system", the parts manager phoned the local warehouse, none in stock, the went on the "nationwide" database, no new parts available in the UK !! 4 hours of searching and nothing ? This is going to be a headache ! Now reached breaking point, I am just a few days work away from completion and now hitting the smallest, but biggest issues of the build. 3. Reverse light switch for MT75 gearbox, is there a second hand one in the UK ? So I've put her away in the garage for a few days, need time to think this over, So close yet so far away ?